In June, 2014, Diane got a chance to try the new Zeiss Victory SF binocular. She birded non-stop with it for three days in Europe, along with an international team of birding enthusiasts. She wrote up her initial impressions here. More recently, we got our hands on a pre-production pair of 8x42 Zeiss Victory SFs, and we compared them to some other top high-end binoculars — the Zeiss Victory HT, the Leica Ultravid, and the Swarovski EL 8.5x42. Because the Swarovski is an 8.5 power, we could not do a fair optical resolution test, but we compared other aspects of the binocular. However, in our previous comparisons of the high-end binoculars (see "Best of the Best"), even when we used doublers to effectively test at 32 power, we could not see a difference in resolution in the top binoculars. We plan to do a full review of both the 8x42 and the 10x42 Victory SFs after they ship, and when we can look at both models and test them against other top binoculars. But we wanted to do something now and at least report on the 8x42, since that is the one we've had the opportunity to compare. We could find no difference in the resolution of the top three 8x42 binoculars: Victory SF , Victory HT, and Leica Ultravid HD. All three are so close to perfect that a 20/20-vision human eye cannot see all the resolution they deliver. You may ask for more resolution, if you wish, but you probably would not be able to see it! So what is unique about the new SF? The SF delivers a stunning 8.5 degree field of view — 444 feet at 1000 yards. Your entire visual field is filled with the magnified image. No black border cuts off your vision at the edges. You feel like you're there! The SF provides over a 10% wider field of view than the Victory HT. This chart shows how the SF field of view specifications compare to other top 8x42 binoculars and the Swarovski EL 8.5x42. A wide field of view matters especially to birders, who are often trying to locate a small object against a large and complicated background. The more of the scene that you can see, the easier it is to find the bird. If you wear glasses, you can still see the whole field of view. What's really great is that the 10-power model also has the same long 18 mm eye relief. Even an eyeglass wearer can get 10x magnification without sacrificing any of the SF's super-wide field of view. Not only is the SF's field of view extraordinarily wide, but it's also sharp edge to edge. It employs advanced field flattening technology. This is a change from Victory HT, which is less sharp at the edges than in the center of the field. Some birders have noted that field flattening technology can create distortion when you pan the binocular. Things seem to swell in the center, as if the image were wrapped around the surface of a sphere. However, Zeiss's field flattening minimizes the rolling-ball effect. We detected almost none of that distortion when we panned with the Victory SF. Want to study a hummingbird up close? And not have to back up to focus your binocular. The minimum focus distance of the Victory SF is 5 feet, besting the Victory HT by more than a foot and making the SF the closest-focusing high-end 8-power binocular. The SF excels in its innovative ergonomics. It is exceptionally comfortable and easy to use. 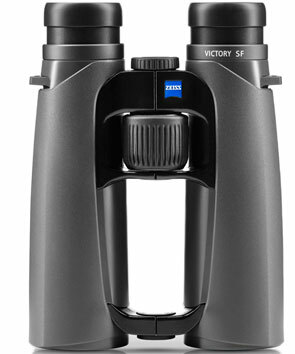 In the new Victory SF, Zeiss redesigned the lens-and-prism system so that the weight is shifted toward the eyepieces. What a difference that makes in the balance! The SF is remarkably easy to hold, as if it wants to settle in position in front of your eyes. You can hold this binocular for a long time, with less fatigue and less hand shake. Zeiss changed the prism system from the Abbe Koenig system to the Schmidt Pechan prism system. At the same time they redesigned the optics so that there is more glass in the eyepiece end and less glass in the objective end, resulting in the remarkable balance of the SF. They accomplished this without increasing the total weight. The Victory SF weights a fraction of an ounce less than the Victory HT, but in the hand it feels significantly lighter. The SF's focus knob lines up just great with your index finger. You don't have to angle your finger away from your hand to turn the knob. We've never seen a focus knob on a full-sized binocular that let you keep you hand in such a natural, unstressed position. These images show the difference in finger spread between a 42 mm Victory SF and a 42 mm Swarovski EL. The Victory SF guides your hand into a comfortable position, one you can maintain without strain. It also encourages you to naturally grip the binocular the same way every time, which makes it easier to point the binocular accurately. The focus knob is large enough so that you can turn it with two fingers or a glove. You can walk two fingers on the knob for super fast focusing. The SF we tested had one of the smoothest, most buttery focus knob we've ever felt. It focused very fast and went from 20 feet to infinity without our raising the finger from the knob. Images seemed to snap into focus. The eyecups extend out far. The 18 mm of eye relief provides enormous adjustment room in the eyecups. Glasses wearers get the full field of view. And non-glasses wearers can comfortably rest the binoculars against the eyes. The triple-link bridge takes the popular open-bridge design a step further. It allows for an easy one-handed grip around either barrel, but the two barrels are connected at three points. For added strength without increasing weight, the barrels are linked both before and after the focus knob, as well as at the objective lenses. Personally, we also love how the graceful curve of the barrels fits the hollow of the hand. The SF shape is both beautiful and practical at the same time. Happy marriage of form and function. The barrels are smooth, without indentations for the thumb, making for a universal design that will fit any size hand. You can hold it the way that you want to. We like that, because a notch or groove that suits one person's thumbs will get in the way of another's. 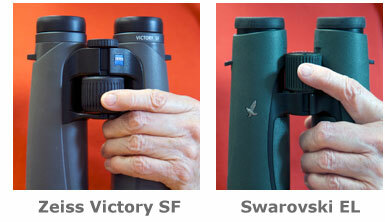 The SF lets your own hands decide how you want to hold your binocular. We found the colors of the SF beautiful. It is black and grey, a pleasing color scheme that looks distinctive. It's unique, and yet it still fits the archetype of what we expect a binocular t0 look like. And what about the 10x42? Diane did not want to part with the 10x42 she got to use for three days last summer. But we have not had a chance to lay hands on one since then. Until we can compare its performance side by side with other high-end binoculars, we will restrain ourselves from passing judgement. However, here is a chart of the specifications of four 10x42 binoculars: the Zeiss Victory SF, the Zeiss Victory HT, the Swarovski EL Swarovision, and the Leica Ultravid HD. There are interesting contrasts in this chart. Of the four, the Leica is slightly shorter and lighter in weight than the other three, although the Victory SF is within an ounce of its weight. The Victory SF has the widest field of view by a generous margin. It virtually ties with Swarovski for the closest minimum focusing distance. And its eye relief of 18mm should be sufficient for everyone. 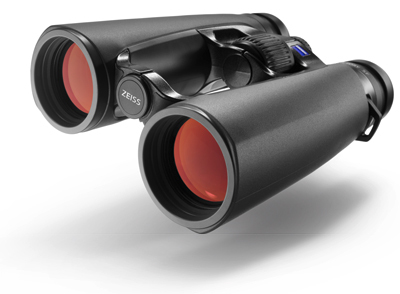 It looks like Zeiss has gone all out to capture the top end of the birding optics market. The Victory SF is not just a tweak of some previous model, but a brand new design. The optics geniuses at Zeiss explain that their goal was to create the best birding and wildlife-observing binocular in the world. Congratulations to Zeiss. We don't know if there is such a thing as a perfect binocular, but Zeiss has certainly leapfrogged in that direction. The only issue with the Zeiss SFs is that they are expensive: $2599.99 for the 8x42, and $2649.99 for the 10x42. There is a reason why these binoculars are costly. When Diane toured the Zeiss production facility in Wexlar, Germany, she spent a whole day watching the SFs being made. There is no mass assembly line. Each binocular is created individually by Old World craftsmen. One binocular at a time. To phenomenally fine tolerances, with painstaking attention to perfection. Zeiss is now predicting the SF will be available early in January, 2015. Zeiss has advised us that supplies may be limited at first. Birdwatching Dot Com is accepting orders now for the Victory SF. Buyers' credit cards will not be charged until we actually ship the orders. Furthermore, before we ship we will contact customers who ordered before the binoculars were available to confirm whether the purchasers still want to complete the order. By ordering now, you take your place in line to receive an SF ahead of those who order later.